Between 1826 and 1832, portions of an old Indian canoe route along the Rideau and Cataraqui Rivers was transformed at the command of the British government from untamed wilderness rivers and lakes into the Rideau Canal Waterway. The purpose of this remarkable engineering achievement was to provide the British army with a safe route for supplying its inland garrisons, avoiding the direct but exposed route along the St. Lawrence which had been threatened during the War of 1812. 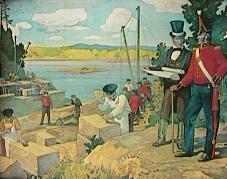 Colonel John By supervising construction of the locks at Bytown. Painting by C.W. Jeffreys. The painting now hangs in the Colonel By Lounge of the Chateau Laurier Hotel in Ottawa. The canal was designed by Lt. Colonel John By of the British Royal Engineers. It was built, for the most part, by independent contractors under the supervision of Colonel By and his staff. Hundreds of Irish and French Canadian labourers, Scottish stonemasons, and British Sappers & Miners battled the Canadian wilderness, nineteenth century working conditions and malaria to complete this wonder of a canal system in less than six years. For more history, view the History of the Rideau section of this website. The Rideau is a unique part of our Canadian Heritage, linking our old national capital of Kingston, with our new national capital of Ottawa. In 1925 the Rideau Canal was designated a National Historic Site of Canada. In 2000 it was designated a Canadian Heritage River and in 2007 it was designated a UNESCO World Heritage Site. It remains the oldest continuously operated canal system in North America, still operating today much as it did when first opened in 1832.